Michael Quetel was nice enough to email me a link to Flash Earth which uses flash to interface with Google Maps and Virtual Earth. I had seen this when it first came out but must have misplaced the link as I never mentioned it on this blog. What I like about it is how easy it is to navigate and manipulate the layers. There are many Flash based sites out there that are such a hassle, but when used correctly Flash is a great tool. 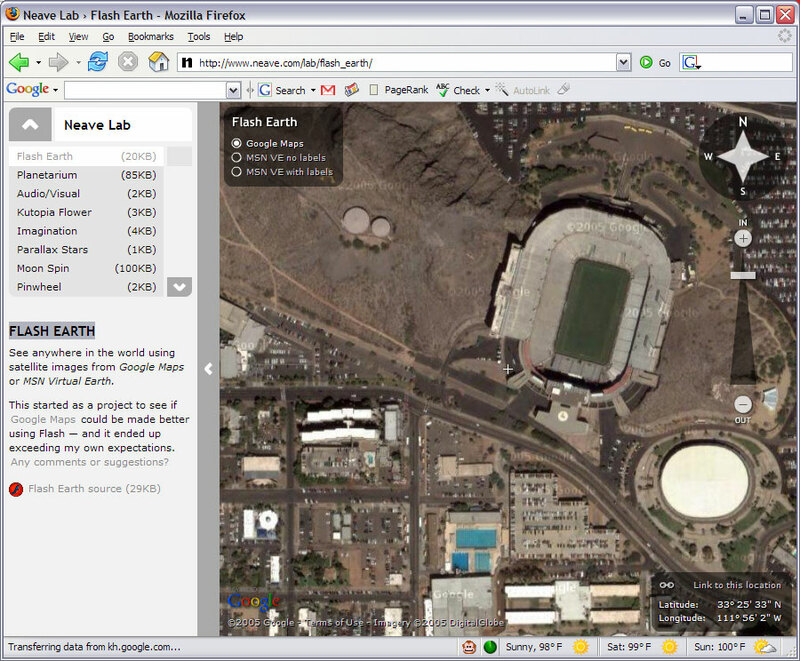 Flash Earth is so simple that it works and that is all you can ask in a web based application. I know ESRI demoed a Flash based viewer for ArcWeb 2005 at the User Conference that was quite impressive. I’m not sure what their other plans for Flash is/are, but could we be seeing Flash become a competitor for AJAX based mapping sites. I’m never big fan of requiring plugins to run content, but I think we can all assume that almost 100% of browsers have Flash installed.